CryptoMaps is an interesting free web-based service giving you a visual representation of the cryptocurrency market state as well as its recent performance and volume or price change. 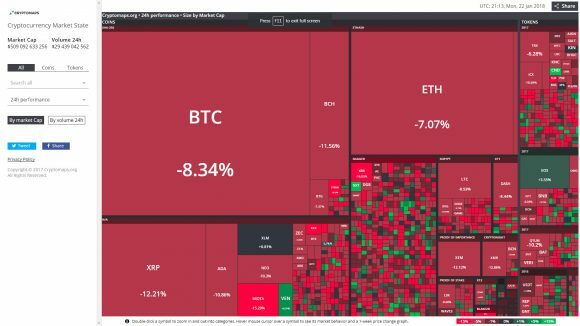 This allows for a quick and easy visual overview of the crypto coins or crypto tokens markets and may even help you sport some interesting things, especially when the market is going down or up as a trend. You can double click to zoom in on a category and see more details, though with smaller coins and tokens it could be useful to have more zoom options available. Still, if you have not used this tool it is worth checking out as it may still provide some interesting information and a different overview of the things you may have used seeing represented only with numbers.